This story originally appeared on the Torontoist. 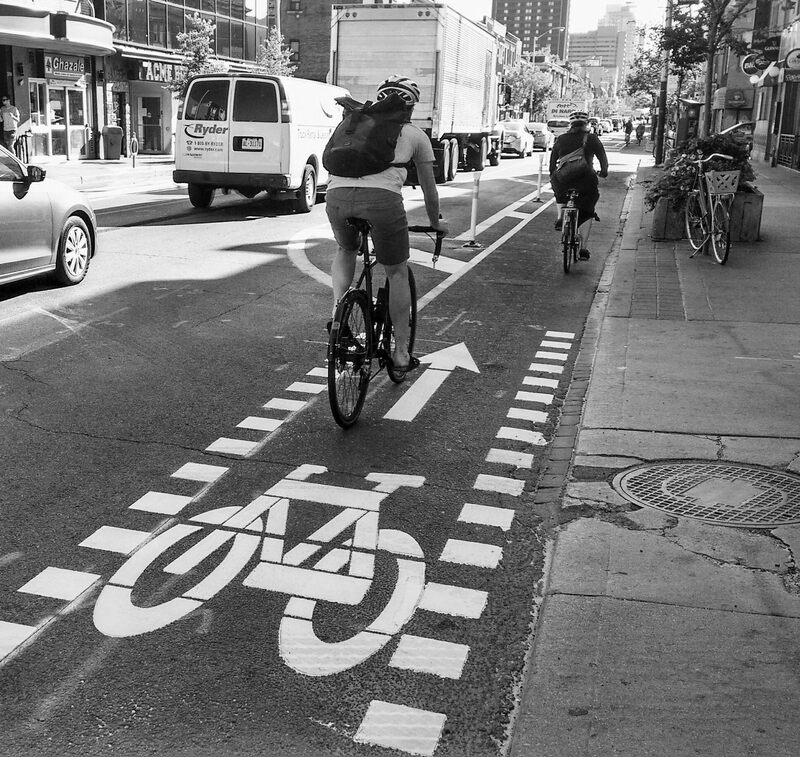 Toronto City Hall hasn’t ranked very high when it comes to installing bike lanes but on excuses for its inaction you can’t help but be impressed by the ingenuity. Instead of bike lanes we often get: “roads were built for cars” (false), “motorists are key to the success of local merchants” (false), or, more recently, “bike lanes cause climate change” (funny). One of the more difficult arguments for cyclists to counter is the drop in cycling numbers in the winter. Now, even this excuse is being challenged by routine observation and data – especially where bike lanes have been installed. Based on our counts over the last two weeks (January 16-27, 2017), the Bloor bike lane was used for an average of 1,700 bike trips per day, rivalling even the summertime ridership for some bike lanes in the city. The gist of the no-one-cycles-in-the-winter argument is that bike lanes are an inefficient use of public space. Since the argument is typically made by the auto lobby, the rationale should be dismissed with a hearty chuckle. After all, the car is a space monster virtually without peer, gobbling up massive amounts of land even when it sits idle. There are, for example, at least four parking spaces (measuring up to 330 sq ft or 12.1 sq m) for every car – three of which spots are obviously empty at any given time. But as every cyclist knows, the pre-requisites for auto infrastructure are far softer than those for cycling, which is why we were motivated to do our wintertime bike count. Our counts took place during rush hour (8-9am) on the Monday, Wednesday, and Friday of each of the past two weeks. As with our count this past summer, even we were impressed by the results. The temperature during our count ranged from 0 to 3 degrees Celsius with consistently overcast skies. The Toronto Star noted that January was a particularly gloomy month with minimal sunshine. (The average daytime high in Toronto for January is -1 degree Celsius.) The bike lane was clear of snow or ice on every day of our counts. The absence of snow or ice in the bike lane over the last two weeks may well have been more important to cyclists than the temperature, especially in light of the improvements in winter cycling gear. Clearing bike lanes of snow and ice may therefore keep more residents on their bikes throughout the year. (It would be worthwhile studying the impact on cycling numbers when there is snow and ice in the bike lane compared to temperature levels.) Of course, motorists too would be deterred --- if not stuck in their tracks with spinning tires --- by snow and ice if cities didn’t spend massive amounts of money salting roads and plowing snow (often into areas used by cyclists or pedestrians). High ridership numbers on Bloor St. are nothing new, largely because Bloor has always been a convenient east-west route leading to a variety of downtown destinations and dotted along the way with important shopping, entertainment, institutional, and educational venues. As long ago as 1896 the Canadian Wheelman’s Association (a national cycling group) proposed a bike network for Toronto that included Bloor St.
City bike counts showed that the number of cyclists on Bloor (between Spadina and Church St.) had increased from 768 in August 1978 --- based on the “maximum 8-hour bicycle volume” ---- to 1,437 in September 1983. 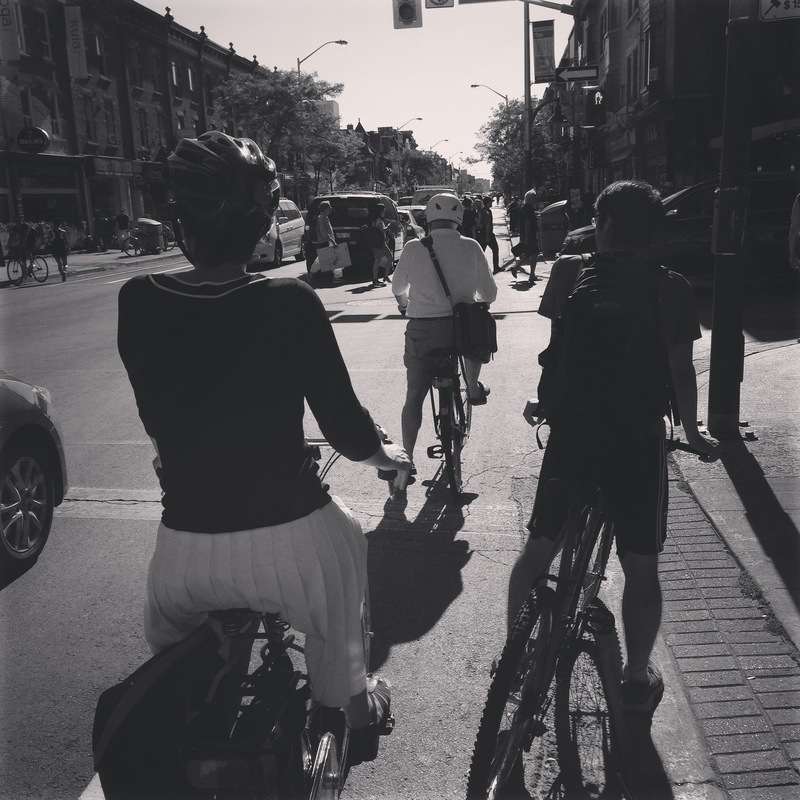 Cycling numbers had also increased on Harbord-Hoskin-Wellesley (an official bicycle route) but at 986 bicycles for the same hours this route still fell far short of the numbers on Bloor, a street that made no provision for cyclists. On October 11, 1983, Works Commissioner Ray Bremner, in a letter to the City Services Committee, wrote that, “the most recent bicycle surveys indicate … that Bloor Street is still the preferred route for the majority of east-west bicyclists travelling in the central area of the City.” Sadly, Bremner’s conclusion didn’t motivate him to push for a bike lane on Bloor but only to recommend (unsuccessfully) removal of the slap-dash bike route (including signs, pavement markings, and a wider curb lane) from Harbord-Hoskin-Wellesley. Bloor, as a so-called “arterial” road, remained the sacred ground of motorists with no regard for the safety of cyclists. 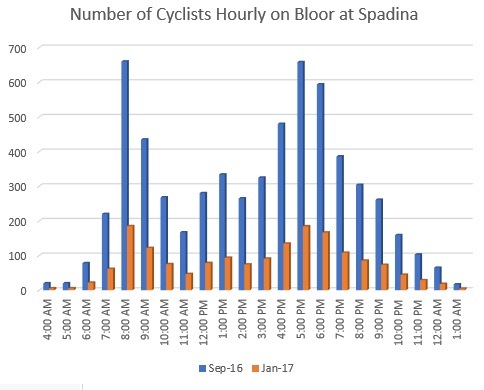 The high cycling numbers on Bloor have remained impressive despite the often miserable cycling conditions and common hazards like “dooring”. While it’s likely that temperatures lower than those of this past month, or more snow and ice, would draw fewer cyclists, it’s no longer the case (if it ever was) that no one cycles in the winter. And when people do cycle in the winter the benefits go beyond a bit of fresh air and include better physical fitness, less car congestion, less pollution, and savings of up to $6.50/day for a two-way trip on the TTC. The wintertime cycling numbers added to those of the summertime --- along with the many other benefits of cycling --- means it’s finally time for the city to put aside old excuses and dedicate itself to expanding Bloor bike lanes east and west and thereby to create a long overdue spine for Toronto’s incomplete cycling network. The city has not released any data on bike counts since the start of the project. According to the director of transportation infrastructure for Toronto, Jacquelyn Gulati she said it will be coming within the next few weeks.